I've had an ARB compressor for a few years and got fed up with it breaking down and popping hoses so I got a Powertank Co2 system - and LOVE it! Which ARB did you have? Light, Medium, Heavy? I usually end up airing up other peeps, so I do both -- air compressor and PowerTank. Have had Powertank nearly since they started. I have the medium duty ARB under the hood. It is easy to use, and if the Jeep is packed with other stuff, I leave my CO2 at home. Most trips where I take the tow rig and trailer, I will have my CO2 tank in the truck if needed. 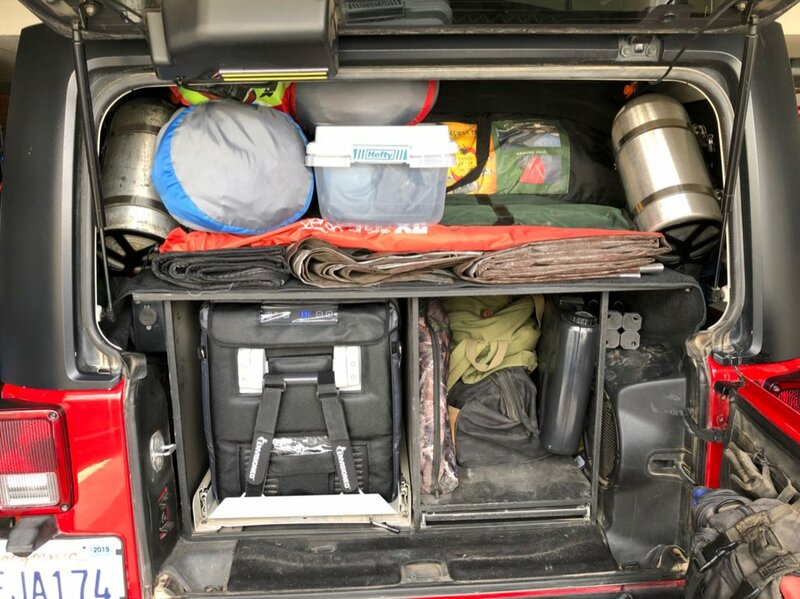 Day trips or a single over-night trip I will usually have the CO2 stashed someplace in the Jeep. Great video. I have always wanted one of those, but have not made the investment. I cant say that I would never have an air compressor as I will run air lockers when I go to tons. Plus I would want to have one in case the power tank ran out of air for back up purposes. Currently I run a Viar Constant duty in the rear, which is extremely slow and will be replaced eventually with an ARB. In the front of the Jeep I use my Warn Power Plant. That thing is amazing and has been one of my best purchases so far. Very quick to air up with and fairly easy to use. The only problem I have is that I have to drag my winch controller out to use it every time. I have the heavy-duty ARB twin-canister, which as I detailed in the video has failed twice and is trying to fail again for a third time.. That combined with the constant issues with hoses and fittings, I'm tired of it.. From now it's a Powertank for me..
I’m not familiar with the PowerPlant, but if it just requires the basic Warn winch controls, this might be a good solution for you. I love mine — just pop the dooh-hicker on the winch at the beginning of the day and hand the remote to whoever is needing my winch. I got an AOB system used not just for tires but for the lockers and the air horn. I don't think the Power Tank can be used for those other tasks. 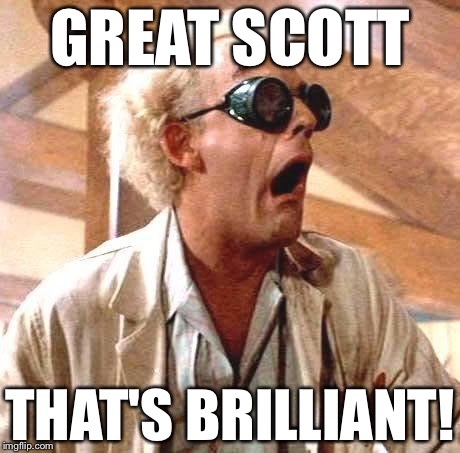 So, as good as it seems, it would be redundant. 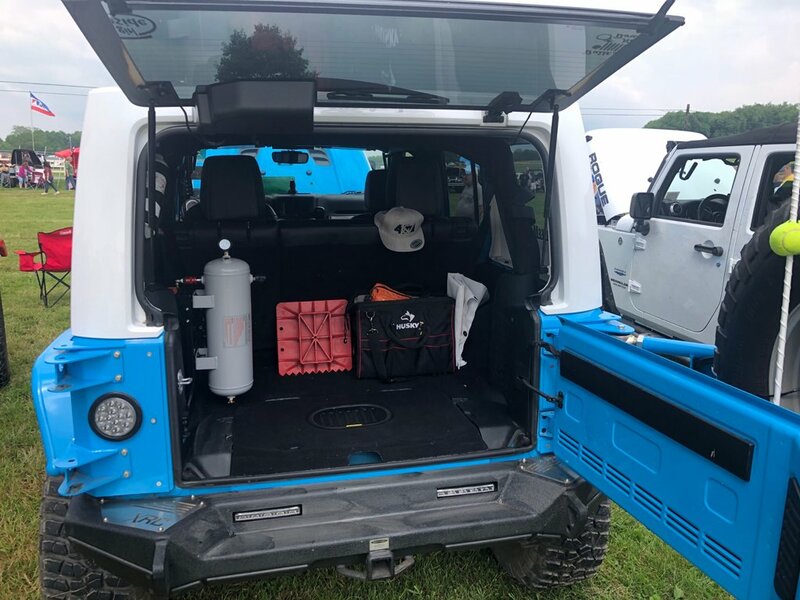 I used the same ARB Twin Air compressor on my JK for a couple of years, a total of a dozen or so outings requiring air up/down my 37" tires and usually helping others. I never had any problems with that compressor and it was way faster than any other I had tried. I installed it using the AFE "Glide Guard" mount that puts it in the space that the huge stock muffler usually occupies. Yes, this required an aftermarket exhaust like the AFE systems. I had this run to a fitting at the rear only and no tank so there wasn't much plumbing to go wrong. My JK was a Rubicon with the electric lockers so I didn't need a tank for that but without one I couldn't run air tools. Now on my XJ I am running a 10# (the # stands for pounds for the younger folks) Powertank and love it! There is no plumbing necessary for the tank itself and I mounted it in place of the "mini" spare tire in the cargo area.On the XJ I have an air actuated front locker and I was hesitant to plumb my main tank to that in case I tore a line off, I didn't want to have my tank empty itself before I was able to shut it off. My solution was to add one of Powertank's 20 oz. Power Shot bottles to run the locker. These bottles are small enough that they easily fit in the seat back pocket of my Mastercraft seats, no wiring (except for the solenoid) and simple push-in fittings on 1/4" line. I did protect the line that runs down my control arm by sliding it through some vinyl tubing. With both the 10# and 20 oz. bottles I'm into the package for about what I would have paid for another Twin Air and installation but have a more reliable system.The Powertank is much faster than a compressor and allows the use of air tools, at the sacrifice of airing up a few tires per tank refill. Another vote for a CO2 setup. Something else to consider when choosing an air system is altitude. The higher the altitude the less dense the atmospheric air pressure will be. A CO2 tank will not be as susceptible as it’s not depending on atmosphere to pressurize a Tire. I think both have their uses. Access to an unlimited air supply (especially when you add an air tank is great, but when airing up big tires there is limp disputing the advantages of CO2. I went with The dual piston ARB to start, but plan on getting a powertank along with the move to 42s...cause who really has time for that ? What bracket is that for your air tank? I hate my current set up for the tank. It’s the Driver side M-PAC Mount made by Springtail Solutions. Its a great alternative to mounting under the passenger seat or Hood (which is where I originally had it...). I prefer twin CO2 tanks. That way you always have a full one even after one runs out. 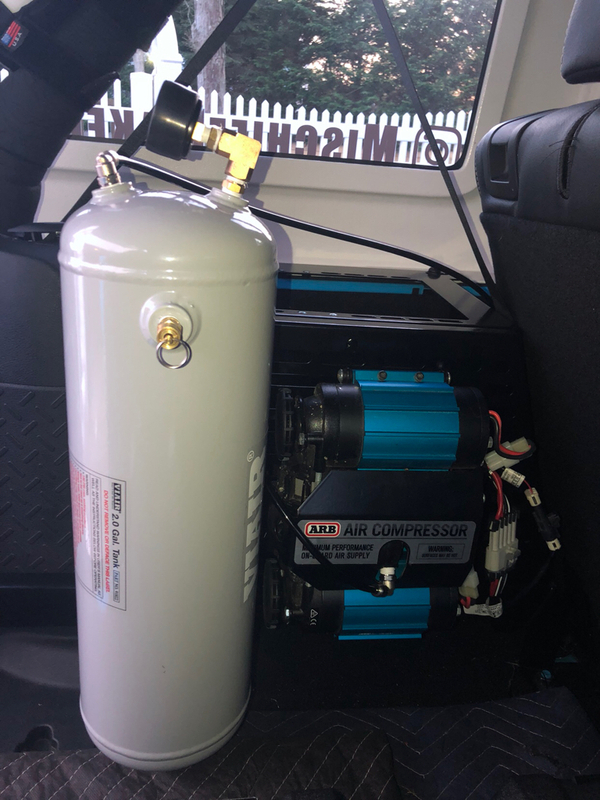 Ive been debating if I want to do an air compressor or Co2. Ive been doing a lot of research and it seems like a Power Tank is the way to go. The ARB compressors seem to wear out with a lot of use. Plus you can fill a Power Tank pretty easily. Is that a home made setup on those tanks?